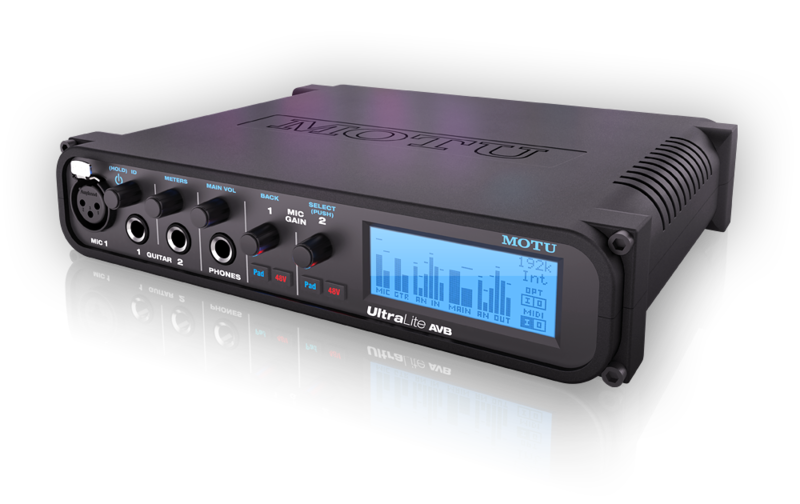 The latest in MOTU's popular, award-winning UltraLite interface series, the UltraLite AVB is an 18-input, 18-output audio interface with DSP mixing, wi-fi control, AVB audio networking and best-in-class analog audio quality for on-the-go mobile audio recording. 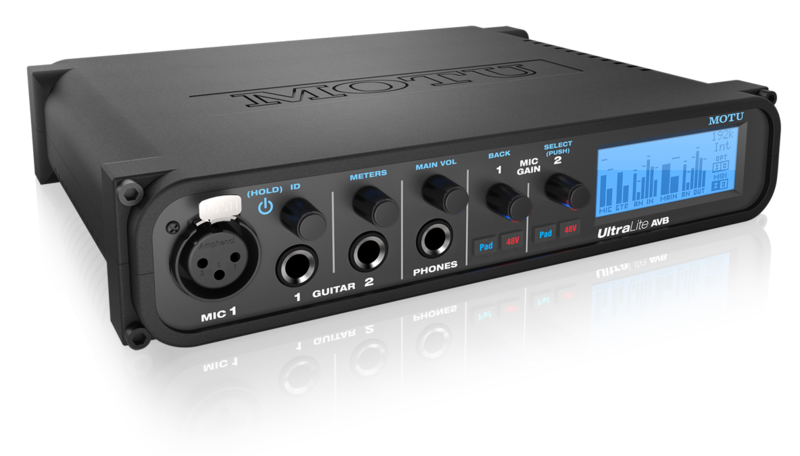 You get 2 mic inputs, 2 guitar inputs, 6 line inputs, 8 line outputs, headphone out and 8-channel optical I/O for a total of 18 inputs and 18 outputs, simultaneously. The optical ports also support stereo TOSLink (optical S/PDIF). 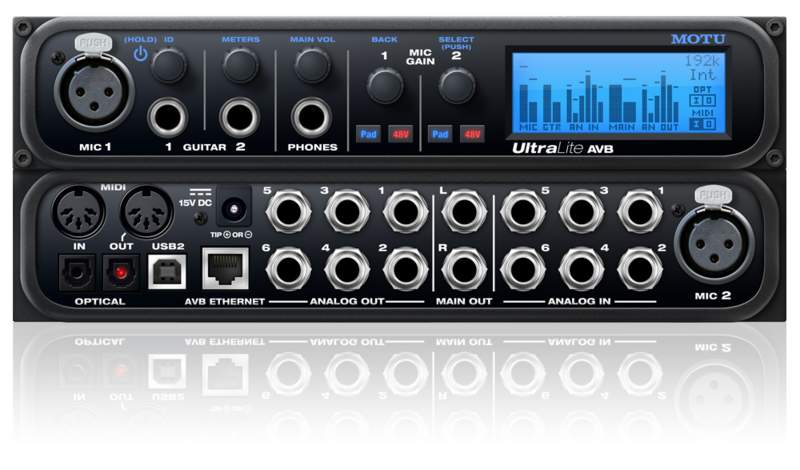 The UltraLite AVB sets a new standard for analog audio performance in a mobile audio interface. The eight balanced analog outputs deliver a stunning 117 dB dynamic range. This level of measured performance had previously only been available in audio interfaces that cost thousands of dollars. The UltraLite AVB connects to your computer with audio class compliant hi-speed USB 2.0 (compatible with USB 3.0 and iOS) for across-the-board compatibility now and in the future. Alternately, if you have a Mac running OS X Yosemite (10.10) or later, you can use a standard Ethernet cable for operation as an audio interface. 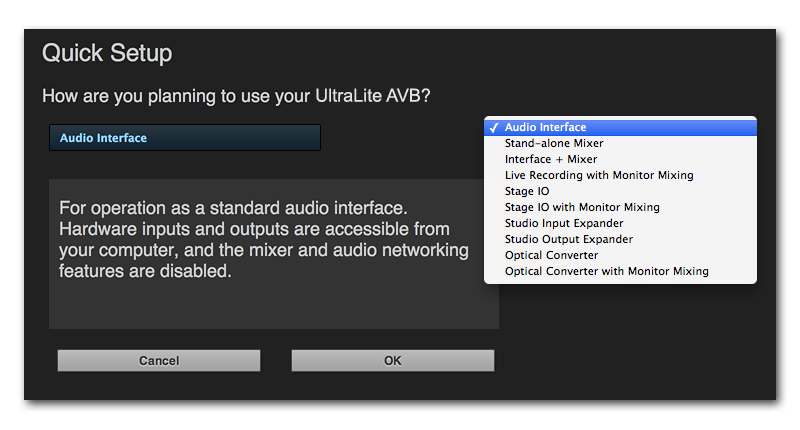 Either way, the UltraLite AVB is compatible with all audio software. The mixer in the UltraLite AVB is a complete departure from earlier models. In fact, it's identical to the mixer found in MOTU's flagship 1248 and 16A interfaces. If you know your way around a large-format mixing console, you'll feel right at home. If you've ever wished to mix on a large console, the driver's seat is now yours. British analog mixing consoles are renowned for their musical EQ profiles. The UltraLite AVB meticulously models these classic EQs to give you the very same, magical EQ response found on these coveted desks. Each input channel also provides a classic compressor with peak/RMS operation. Groups and the Main Mix bus are equipped with MOTU's Leveler™, an accurate model of the legendary Teletronix™ LA-2A™ optical leveling amplifier, known for its highly sought-after Automatic Gain Control (AGC) characteristics. The software that you use to control the UltraLite AVB doesn't reside on your hard drive. It's a web app served from the hardware itself. 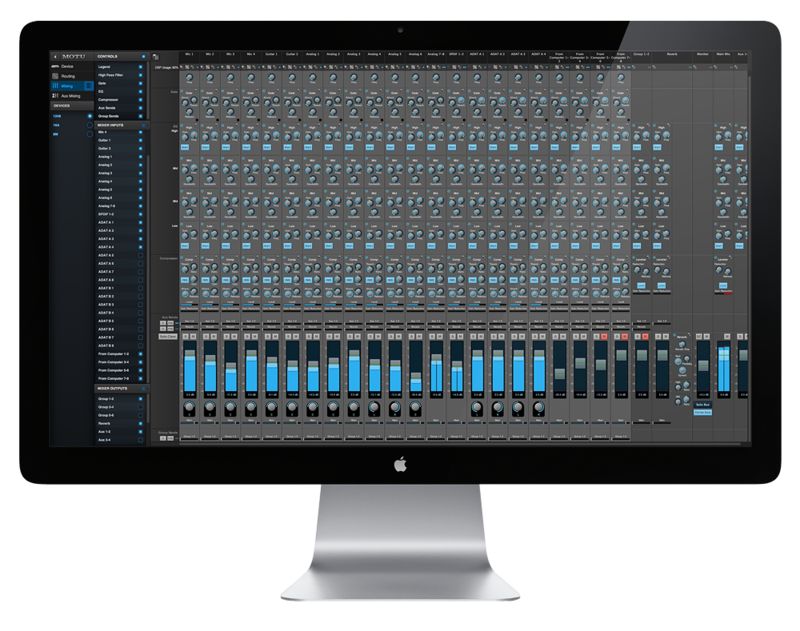 This means you can control the UltraLite AVB on-board DSP, mixing, device settings, and network audio routing from your favorite web browser on a laptop, tablet or smartphone connected by wire or Wi-Fi to your local area network. Use any web client on any platform - Mac, Windows, Linux, iOS, Android - as long as it shares the same network. 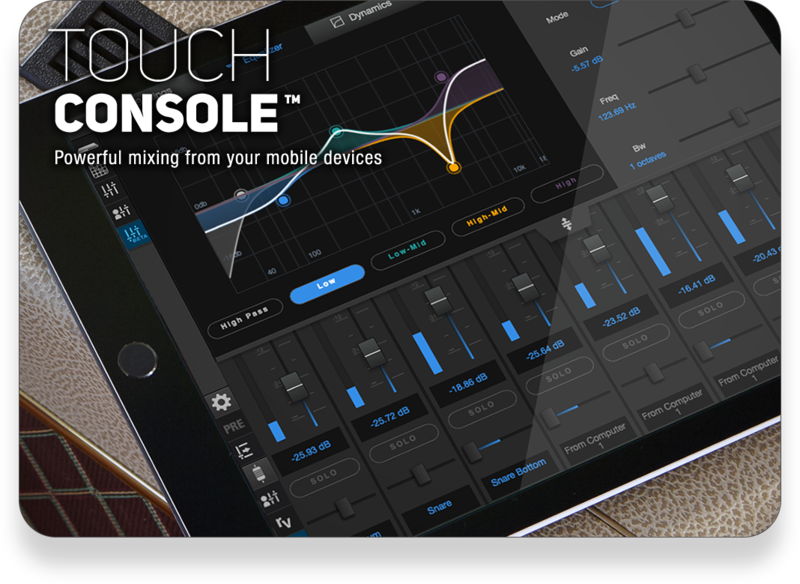 Designed specifically for touchscreen operation, Touch Console™ delivers a whole new mixing experience. 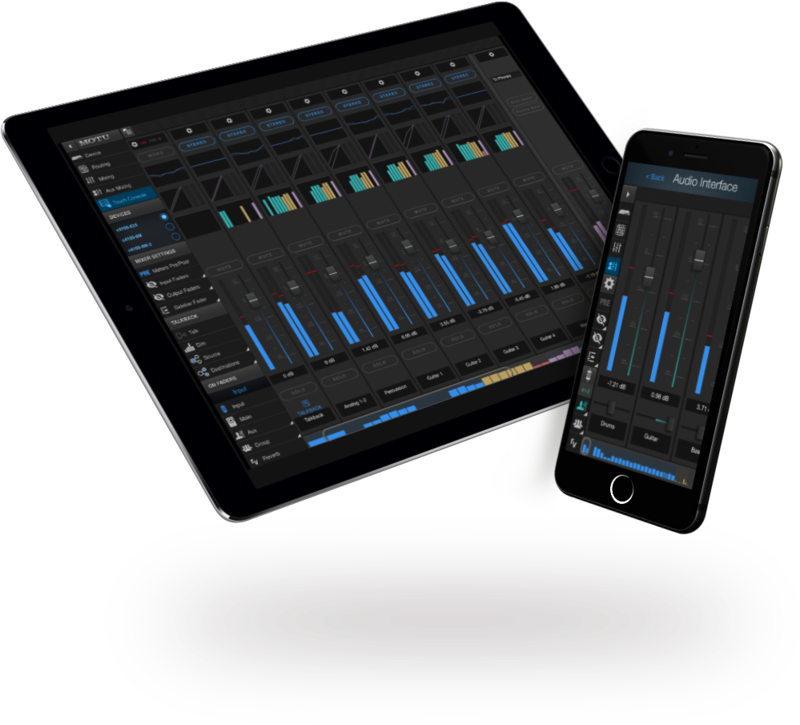 Access Touch Console from your tablet or smartphone to effortlessly control the powerful 48-channel mixer and effects in the UltraLite AVB. With large targets for your fingers, multi-touch operation and intuitive design, you can tap, swipe and pinch your way to a perfect mix, every time. 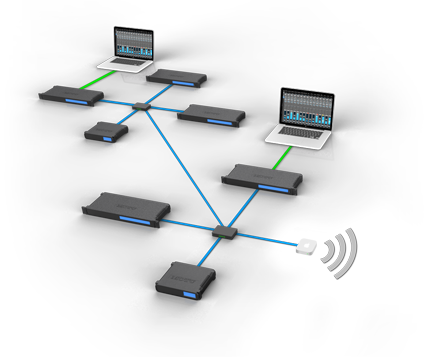 Connect an Apple Airport™ or other Wi-Fi router directly to the UltraLite with a standard Ethernet cable and control the UltraLite AVB's powerful mixing and DSP effects from your smartphone or tablet, without a computer. 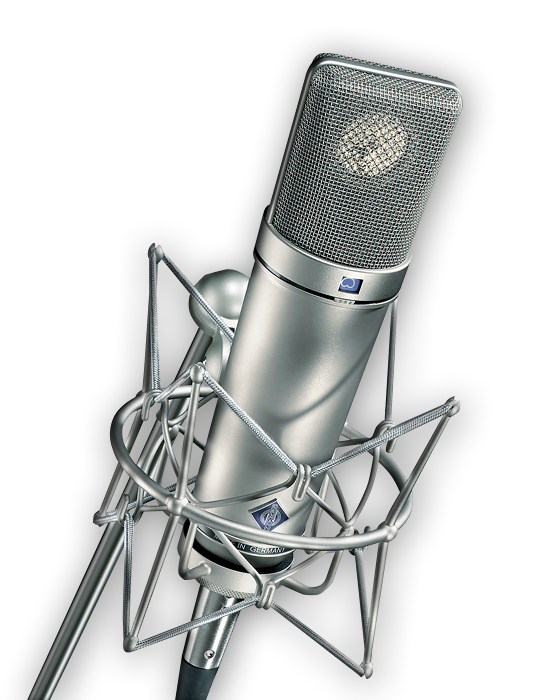 Great for live sound mixing! The UltraLite AVB network port introduces AVB Ethernet, the new industry standard developed by the IEEE for professional audio networking. Add a second MOTU AVB interface (1248, 8M or 16A) with a simple Cat-5e or CAT-6 ethernet cable. 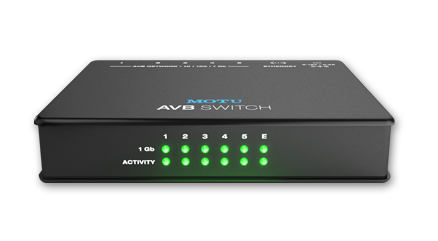 using a MOTU AVB Switch (sold separately). Build a network with multiple interfaces, computers, and AVB switches using standard network cabling, with ultra-low network latency, even over long cable runs (100 meters point to point). Stream hundreds of audio channels among devices and computers on the network. The large backlit 128 x 48 pixel LCD lets you view all signal activity at a glance with detailed metering for all analog and digital I/O. 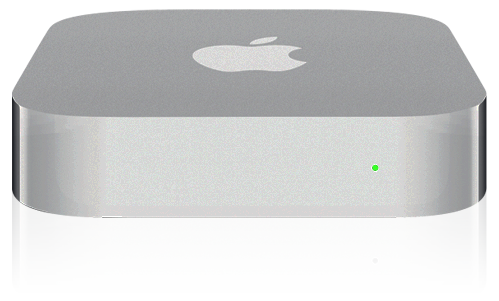 Access hardware settings from a simple and convenient menu. The UltraLite AVB is so flexible, it can serve many roles — in the studio, on stage, and throughout an installation. 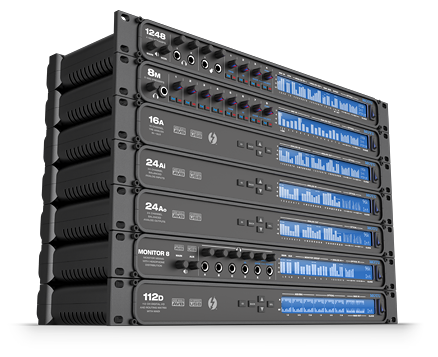 The Quick Setup menu lets you instantly reconfigure the UltraLite AVB for many common situations, from operation as a standard audio interface to serving as a network "snake" from one location to another. Once a preset is chosen, you can easily customize the routing grid and mixer settings to further suit your specific needs — and then save your own custom presets.